'Birdboy' Is A Dark, Beautiful, Boundary-Pushing Animated Film Three adorable anthropomorphic animals wander a post-apocalyptic hellscape in this hand-drawn animated film from Spain that "thumbs its nose at traditional G-rated storytelling." 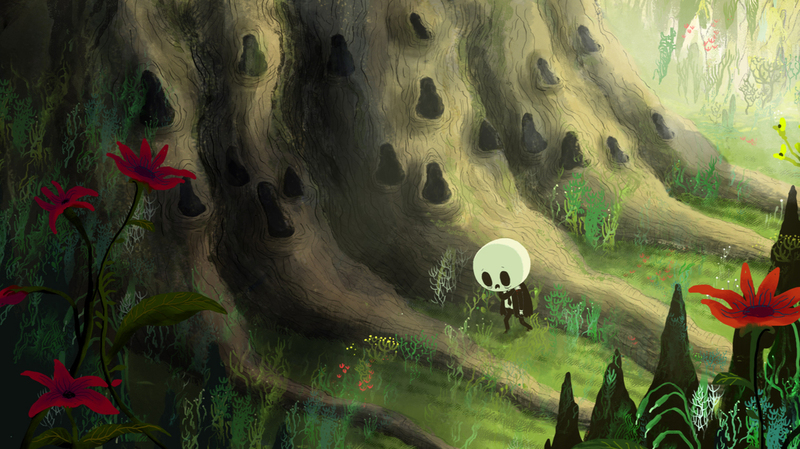 Birdboy: The Forgotten Children is a film based on the graphic novel by Alberto Vázquez. Just how dark is Birdboy: The Forgotten Children, a trippy animated folktale from Spain about a bunch of talking animal adolescents searching for a better life? Well, even the tottering alarm clock seemingly there for comic relief wails to its owner, "Why do you always have to hurt me?" In fact, the bulk of the movie consists of adorable, anthropomorphic objects and critters getting hurt, often in some grisly fashion: an inflatable PVC duck who screams when he's deflated; a chirping bird who gets shot to death, leaving behind starving chicks; a baby Jesus doll who cries an alarming amount of blood when his owner squeezes him. Yessir, the Happy Meal toys are sure to go flying off the shelves for this one. Yet given how rigid and formulaic most mainstream animation is, there's something liberating about watching a traditionally hand-drawn cartoon thumb its nose so gleefully at traditional G-rated storytelling. If it were all being played for mean-spirited, South Park-style laughs, such psychedelic carnage might have been unbearable. But the movie plays it relatively straight, imbuing each of its many creations with real soul and pain. First, to get the obvious joke out of the way: No, Birdboy is not a prequel to Birdman. If anything, its technique is even more daring than that faux-single-take Best Picture winner. Co-directed by Petro Rivero and Alberto Vázquez from Vázquez's graphic novel Psiconautas, the film was a 2015 release in Spain but is only now seeing U.S. screens thanks to the efforts of GKIDS, the daring boutique distributor of boundary-pushing animated features. Birdboy might be their most out-there acquisition yet. Its cute animals make reference to nuclear holocaust, landfill overflow and rising sea tides. Conventional cute-animal wisdom says that only Art Spiegelman can get away with this kind of stuff, so if the film sneaks a Best Animated Feature Oscar nomination, it would be a blessing from the underground. The film's central hero, a mute, Jack Skellington-looking bird-child with a pale face and black-hole eyes, is a drug junkie on the run from racist dog cops who want him dead. Birdboy and his brethren live on an isolated island, the choppy waters penetrated only by the beam from a crumbling lighthouse that's not always in operation. His only friend is Dinki (voiced by Andrea Alzuri), a mouse who drapes a pearl necklace over one of her ears and dreams of escaping the island and the iron thumb of her crazed, religious parents. (Dinki's house, a domestic family horrorshow, is like a refugee from the work of R. Crumb.) Dinki hasn't seen Birdboy for weeks and fears the worst for his fate even as she and her companions – a fox and a bunny – make their escape plans and set off into this dangerous world. The kids' odyssey will take them into bleak and unforgiving territory, but the darker that Rivero and Vázquez get, the more indelible their vision becomes. We meet a piglet in a sailor's outfit whose mother, possessed by a druggie spider, forces him to shoot her full of heroin-like "medicine"; the fact that it's the spider doing all the talking creates the perfect metaphor for the way someone's personality can change under addiction. There's also a landfill that seems to take up half the island, and it's home to a thriving society of those "forgotten children": a cabal of orphaned rats turned savage predators, who chant, "The future is past, garbage is the present, blood is our law!" It's all basically a grab-bag of society's ills, and the post-apocalyptic setting feels overly familiar by this point. But the fluid, expressive animation is of the sort that we haven't seen since Don Bluth's heyday. Usually, when there's a new GKIDS feature that exists far outside American standards for animation (e.g., dangerous subject matter untouched by pop-culture references), critics will make a special effort to reassure everyone that it's totally fine for thoughtful children and thoughtful parents. That was the case last winter with My Life as a Zucchini, a Claymation feature about foster kids that only used its traumatic subject matter as a way to demonstrate how resilient and inspiring the strong youth can be. Birdboy, though, should most definitely not be shown to young children. This one is reserved for the moody, anti-establishment early teens, the ones already doodling obscene images of their former Disney heroes into their high school notebooks. It will confirm their suspicions that the world and everyone in it are decaying before their eyes. And it will take flight.